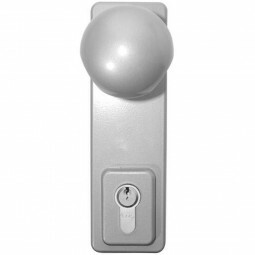 The Asec Knob Operated Outside Access Device is used in conjunction with emergency exit devices and allows the internal device to be overridden and the door opened from the outside. Suitable for use on wooden or metal doors. Supplied complete with euro cylinder. Can be fitted to doors of between 40mm to 70mm thick. For use with emergency exit devices.